Hello all and I hope everyone’s enjoyed the heat and sun we’ve had till recently. I’m taking full credit for bringing that weather back from the south of France on 20th June. Whisky won’t re-hydrate you but maybe put a little more water in it or have a glass of water alongside. First mention this week goes to a squash match in aid of good causes and the bottle being auctioned is a 34 year old Port Ellen from Fred Laing’s own collection and originally retailing at £1,500. It was distilled in May 1982, before being charged from one refill hogshead cask and bottled in November 2016. Fred, chairman of Douglas Laing & Co. matched his squash skills and experience against Greg Dillon, founder of Great Drams. I hope Fred won’t mind me saying this but it’s likely there’s a reasonable age difference, not in his favour… but he did win, so many congrats to him. 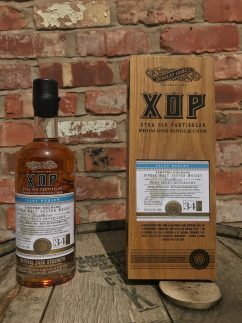 The bottle can be bid for on https://www.greatdrams.com/product/portellen-34-year-old-single-cask-single-malt-whisky-from-douglas-laing/ . You have to register first to bid. The good causes to be supported were the RAF Benevolent Fund as Fred’s father served in the RAF – the company has long association with the charity – and Ollie’s Army, a charity raising funds for research into Batten’s Disease which affects children and is always fatal. Over time affected children suffer worsening seizures and progressive loss of sight and motor skills. Greg chose the charity after reading about Ollie and his sister. Despite his win, Fred is insisting all funds raised from the auction go to Ollie’s Army in this instance. What a star! If you don’t want to bid or get there too late you can donate to either cause on https://www.justgiving.com/fundraising/fred-laing or https://www.justgiving.com/crowdfunding/greatdrams-ollies-army . A fine bottle for any serious (and moneyed) whisky aficionado but remember, it’s for drinking and enjoying, not for investing. A few new samples this last month for nosing and tasting and one which didn’t get covered last time. The latter was Scallywag 10 Years Old from Douglas Laing. Of the others, one is a new Highland Park for Travel Retail and the other a new Jura. 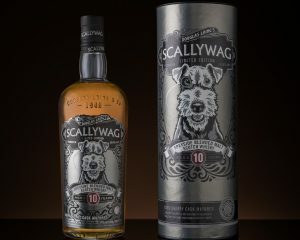 Scallywag 10 Year Old Blended Speyside Malt (46%). This one is a limited edition of 4,500 bottles at likely retail price of £49.99. It was matured in former oloroso and PX casks and there is no added colour or chill-filtration. In keeping with the company’s quirky sense of humour this is to celebrate their 70th anniversary “in dog years”. Appearance: Rich, sunny gold and a touch of brassiness. Nose: Quite raisiny at first; some citrus zest and some youthful, “airiness” and some creamy notes. With water, there’s more light fruit cake and baked apricot/plum and oven-cooked banana. Palate: Slightly luscious mouth feel; quite rich; ripe stone fruit and banana; sweet then bitter notes; a hint of oak. Not massively complex but also far from simple. A credit to blending skills for integration. Finish: Quite long and drying with some greenness at the end. A very acceptable dram which would also be good for a cocktail base, giving some bite and character but also roundness. 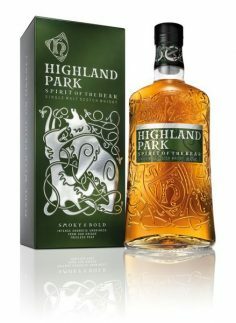 Highland Park Spirit of the Bear – 40% vol. No age statement. Natural colour. This one is part of a series of four for the travel retail sector. They each come in a 1 litre size. The series celebrates and is inspired by animals which held iconic status for the Vikings, who once controlled the Orkney islands where HP is situated and who left many marks on the islands not to mention their DNA in current inhabitants. Appearance: Bright, ripe barley gold. Swiftness of tears suggests some younger whiskies in the vatting. Nose: honey; some hard cheese and slightly sweaty at first but soon dissipates; a youthful spirit note too; smoke, but integrated and not dominant; some dried fruits plus mace and ginger. Touch of oak – some fresh wood notes. With water, it’s creamier; a touch of sharp cologne and a dab of sultana. It’s subtle but enticing and you want to explore more. Palate: Quite light-bodied with oak and its tannins, vanilla, honey, licorice; hard cheese rind, lactic notes. Definite smoke and light toast plus a tiny touch of salt but not like the western islands’ whiskies. Finish: quite long and dry with licorice and smoke, cooked barley and a just a little bit of salt. Due to a processing issue, I received three samples of this one rather than one each of this and the other two (Loyalty of the Wolf and Wings of the Eagle) released at the same time. Hopefully those will be here in time for the August column. The fourth in the series is to be a 46% Travel Edition of their 18 Year Old Viking Pride which should be in Europe in August and Asia from late September. 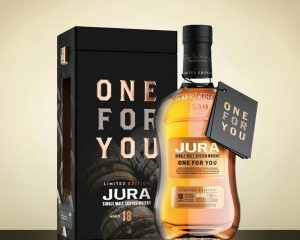 Last up for tasting this month is Jura One For You – 52.5%vol. This is the third and final expression in a limited edition series that began in 2016 with One for the Road, to mark the retirement of distillery manager, Willie Cochrane (met him in the ferry queue when going to Islay for this year’s Whisky Fest and he was looking good and relaxed). Next one up was One and All to celebrate the Jura community and distillery team. This one raises a glass to Diurachs round the globe and those who share the island’s community spirit. It’s 18 years old and will retail for around £130. Natural colour and no chill-filtration. Appearance: Rich, summery gold with brass and greenish highlights. Nose: Juicy! Damp woods; ripe stone fruits and sultanas; dried citrus peel; vanilla and soft oak notes- just like stepping into an earthen floored whisky warehouse; pear drops and “perfumed”. With water more pear drop/ acetone comes through; quite rich and woody base notes with more emphasis on the dried, candied peel. Warm honey over baked fruit and barley sugar. Palate: Medium mouth feel – slightly luscious; deep oak with accompanying tannins; dried fruits and then bitter almond on some parts of the tongue and coconut sweetness on others; a bit of vanilla pod; sweet, young hazelnuts. They say white chocolate but I didn’t get it. Finish: Long, sweet then dry and astringent with firm, malty notes at the end. I hope there’s still enough of summer to come to allow you all to try whiskies which lend themselves to warmer days and more summer drinking. Not linked to summer drinking, I’m looking forward to trying some new Mortlachs and, hopefully, a sample of a new Aberlour or at least the media release. Someone I know gave us a peek at it online so I hope to get to try it. I had Canadian clients at Aberlour Distillery in June who were well looked after and another group visiting there, too, in September. Let me leave you with the info that Latest figures from Moray Speyside Tourism suggest that the economic impact of tourism there rose by a massive £11 million in 2017, with an extra 50,000 visitors compared to the previous year, representing the biggest ever surge in tourism in the area. We are told, “experts believe that a range of factors are fuelling tourism growth in the Moray including a surge in interest in whisky, growing awareness of the beauty of the Moray coast, and that the region offers the best of Scotland in miniature without the congestion and ‘over-tourism’ of some other destinations.” Long may that success continue but I hope it’s not going to turn into Scotland’s northern “Route 66”. Was thinking about that for some holiday myself but have been warned off by friends who say my patience will be sorely tried at being stuck behind convoys of motor homes from Europe… Might still be worth a try! See you next month and happy dramming for August.